The Fontainebleau II Miami Beach offers options for everyone. 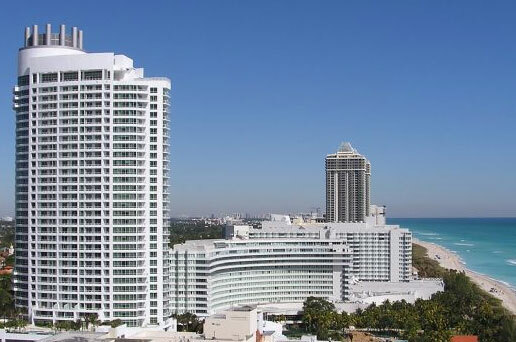 Situated right on Miami Beach, the Fontainebleau II provides the opportunity to live in pure luxury and when you are not in residence at your condo you can choose to place it into the hands of the Hilton Management Program and then rent out your condo on a daily basis or even on a weekly or a monthly basis. With an expansive 18 acres of entertainment, The Fontainebleau II offers a wide array of different options for enjoying your free time. The water playground is completely family oriented and is the ideal place for families to relax and enjoy themselves. There is even a supervised children's activity center. For more active pursuits you can choose from lighted tennis courts and numerous water based activities along the 1,200 feet of shimmering white sand ocean front beach. Jet skiing, parasailing, swimming or simply soaking up the South Florida sun; you can enjoy all of it from the beach right alongside The Fontainebleau II. Along with active pursuits there are also many other entertainment venues that you can enjoy right at The Fontainebleau II, including lounges, entertainment options and even dancing in the spectacular Club Tropigala. Whether you want an exciting night out or you simply want to meet a group of neighbours for a drink, you will find plenty of options. For those who are health and fitness conscious, there is a state of the art fitness center that offers a complete menu of services and classes, including private one on one sessions as well as a unique salt water pool. If you are watching calories, you can also stop by the Spa Eatery for delicious and nutritious snacks or quick meals. In addition to the Spa Eatery, there is also a wide variety of formal as well as casual eateries and restaurants that offer everything from traditional American fare to more exotic options, such as Japanese cuisine. Whether you ae looking for breakfast, a late brunch, a light snack, dinner or a midnight snack, you will find plenty of options. The Exclusive Owners Lounge is also available for cocktails and hors doeuvres. If you find that you need something, there is a shopping arcade where you can shop for everyday sundries as well as antiques. Other luxurious amenities which you will be able to enjoy include turn-down service, laundry and dry cleaning service, maid service, room service and valet parking.